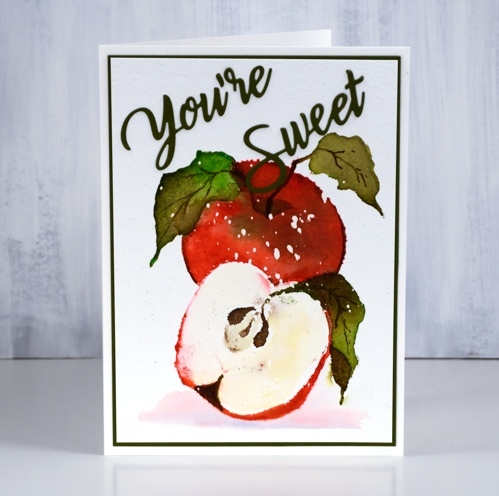 Today’s card cannot guarantee you the health benefits of an actual apple but I hope it brings a smile. I stamped and painted it with distress inks and I’m sorry to say I didn’t record the colours. I was attending an all day crop and teaching a few mini classes during the day. My table was set up with inks and stamps and watercolour paper and I came and went from classroom to table resuming my card panels whenever I returned to my table. My best guess would be festive berries, mowed lawn, vintage photo, forest moss, gathered twigs and squeezed lemonade. Maybe I should tell you my process instead because apples come in a range of colours; there is no wrong answer! I used my stamp positioner and worked one colour at a time. 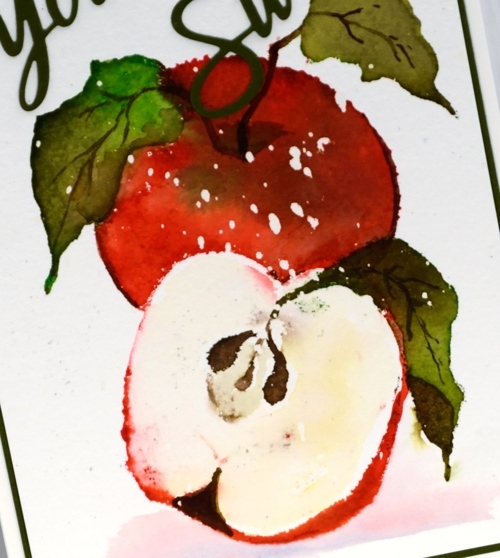 I inked the apples in red and wiped any red ink off the leaves before stamping then I used water and a paintbrush to blend all the stamped ink to cover the apple skin. While the area was wet I dropped in some green ink to create some variation and shadow. I dried the red before inking all the leaves in the two greens, stamped and blended them with a paint brush also. I inked the stems in brown and stamped them over the leaves. Once the leaves were dry I also used some brown or maybe forest moss ink to paint the veins back on the leaves. I stamped the centre of the cut apple with brown ink and painted some onto the shadow at the bottom of the apple also. The flesh of the apple looked a bit too stark so I painted some yellow and blended a bit of the red from the edge into the white area as well. You’ve probably noticed my apple looks like it is in a snow storm. I worked on cold pressed watercolour paper splattered with masking fluid, probably not entirely necessary for a close up apple image but I’m claiming artist’s licence. I had splattered masking fluid over a batch of cold pressed panels in preparation for the all day crop as I was planning to work mainly on snow scenes. When I went to assemble the card I thought the apple needed a bit of shadow to ground it so I painted some diluted festive berries and chipped sapphire ink because they were in reach on my desk. As is often the case for me, I left any thoughts of a sentiment until the end. After a search through my sentiment dies I settled on ‘you’re sweet’ then matted the panel in the same green cardstock. Do you have an apple a day? I usually do but sometimes there are peaches or mangoes or nectarines that distract me from the humble apple. You make it sound easy and straight-forward, but I suspect it was a tough challenge. It looks as inviting and tasty as my Royal Gala before dinner each evening.